In recent weeks, I’ve been battling a lot of anxiety. With so much on my plate, there are times I end up feeling paralyzed, wondering what my next step should be. Besides running off to the private island, I keep thinking I should buy. Getting my new “His Unfailing Love” journal published was once again plagued with massive computer issues. Massive computer issues that kept me from getting all sorts of work done. Our family is getting my Mom ready to move into an assisted living facility. This move has been filled with many unknowns including when her room would be ready let alone and how do we would get her packed and moved. It’s added a lot of extra traveling to my schedule. I’ve been needing to take more time off of work to get everything done and wondering about finances over the next few months. With all the stress, long days, and late nights my fibromyalgia and Lyme symptoms have been flaring up. Yeah, it’s been a quite the start to 2019. Over the years I’ve found that taking an action step, no matter how small, changes things. It snaps me out of the overwhelm so that I can move forward again. That small step leads to another, and then another. Soon, I am making progress and have a weapon that helps me fight against the overwhelm and anxiety. 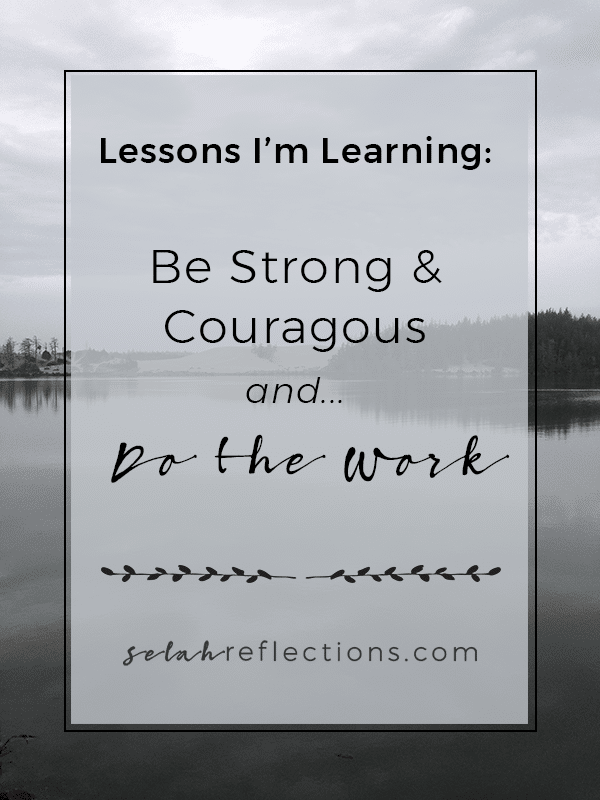 Be strong and courageous, and do the work (emphasis mine). Do not be afraid or discouraged, for the Lord God, my God, is with you. Some times doing the work is hard. We would much prefer to curl up in a ball, hide from the world and binge watch Netflix as an escape from what is going on around us. And you know what? Some days that’s okay. Most of the time, however, we need to just do the work. Clean the house, make the meal, pull out our Bible, set aside time for prayer, pull out the client project that’s been delayed far too long, get the book published, or sit down and write your daily 500 words. There are so many different action steps we could take both big and small that can help move us forward and get back on track. Today, my “do the work” action step was to get a blog post written, even if it was shorter than usual! Do you need to “do the work” today? What is one small action step you could take to fight anxiety and overwhelm? Marta Goertzen is an entrepreneur, writer and nature photographer. She daily explores the trails and beaches of the South Central Oregon Coast with her buddy Bailey. You can follow along on their adventures on Instagram. She is also the author of several books including her newest, “His Unfailing Love: A Daily Quiet Time Journal”. Lessons Learned Part 1 – What Are Your Non-Negotiables?